Team Copioli put a large emphasis on acquiring balls off the floor. It was decided that the most convenient way to pick up the ball was to have it go over top of the bumper, and not have to design in any breaks in the bumper. 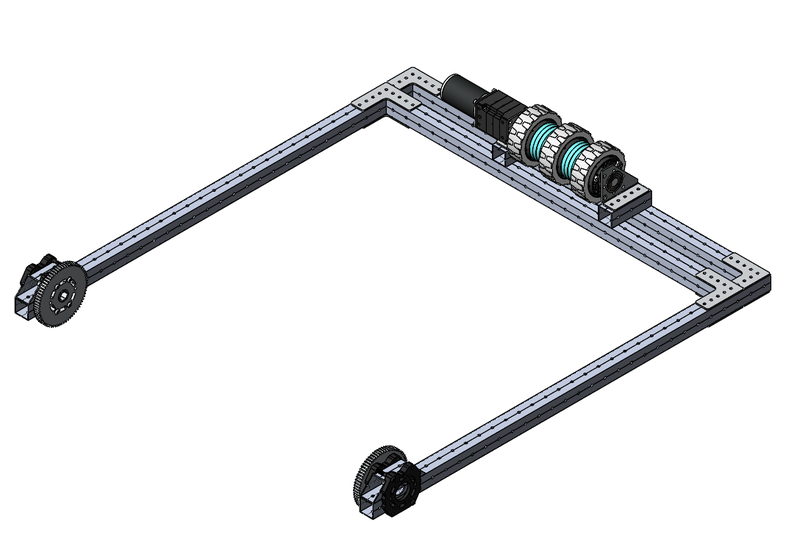 Our past experience led us to prototype a roller claw, as they have been very effective in past FRC challenges. 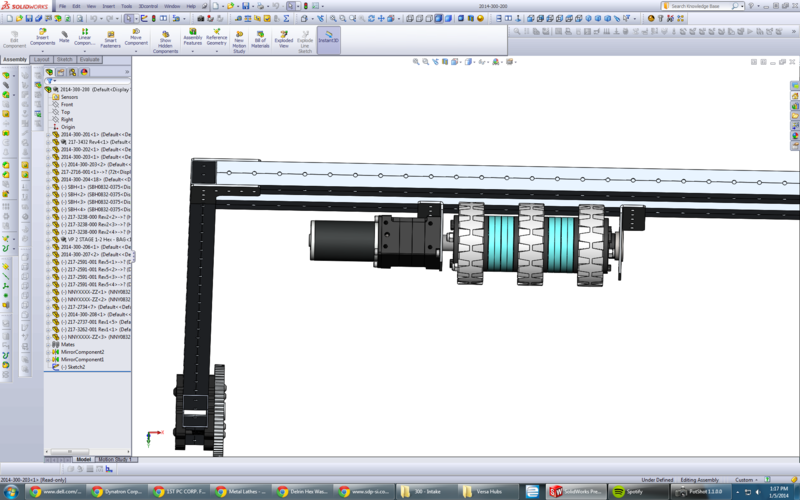 The prototyping was instantly successful, so we moved straight on to CAD. At first, we attempted a roller claw similar to 1114’s Simbot SS from 2008, but the geometry didn’t work out the way we wanted. Here, we used VersaHubs to transmit the torque. We’ll get into the ‘why’ of that more below, in the Q&A. 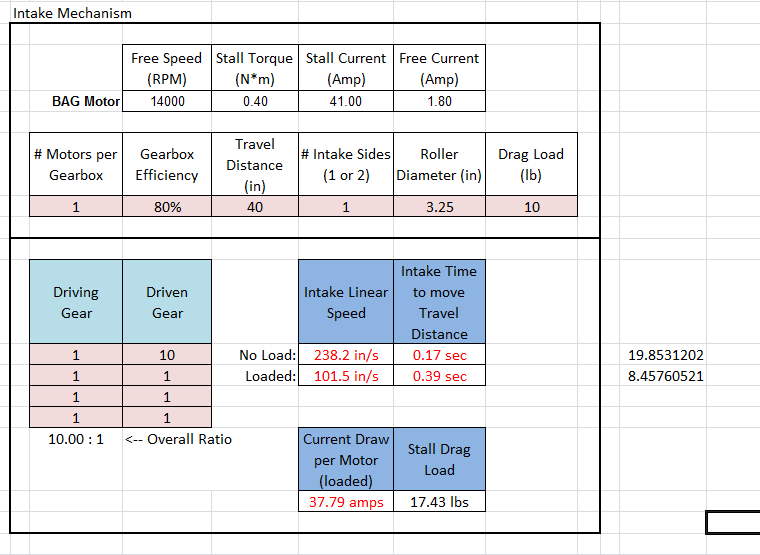 This is the final version of the intake (for now) showing the roller and some gears we have on the arm. We’re not planning on using the gears for their intended purpose. If we have time, we’d like to try putting encoders or potentiometers on them in the future. The intake, integrated into the drivetrain. To get some insights into the how and why of this design, let’s talk to James Tonthat, who was the lead engineer on this subsystem. Q:What did prototyping tell you? 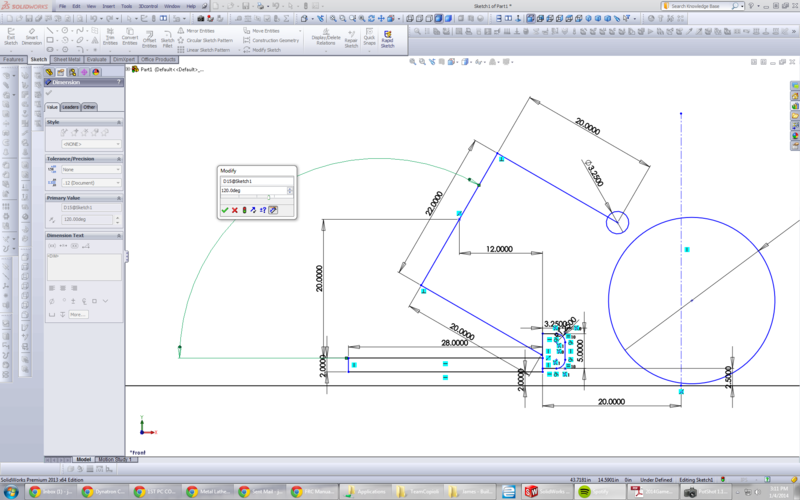 Before we even started prototyping, we began with some Crayola CAD to figure out measurements that might work. 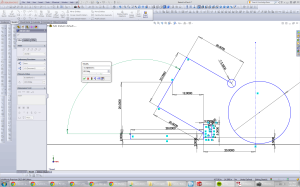 Just some simple shapes in SolidWorks, but once that started working out, we started to put them together with what we had around. It took about an hour to dig parts up, but we clamped together the VersaFrame and played around with the dimensions – and when we showed it to Paul, he said it was “money in the checkmate bank”…so back to CAD we went for a more formal documentation. 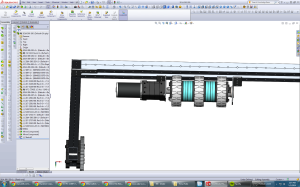 Q: How did you decide on pneumatics vs motors for the actuation of the mechanism? Usually, with a longer build season, you’re able to figure out what pneumatics you want & can order them – the lead time is long, but that’s okay when you have six weeks. 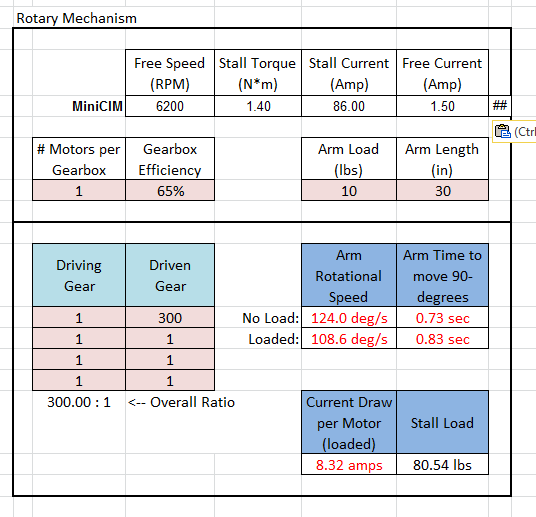 Since we only have 3 days, we’re limited in what we can use- and, quite simply, we have more motors on hand. 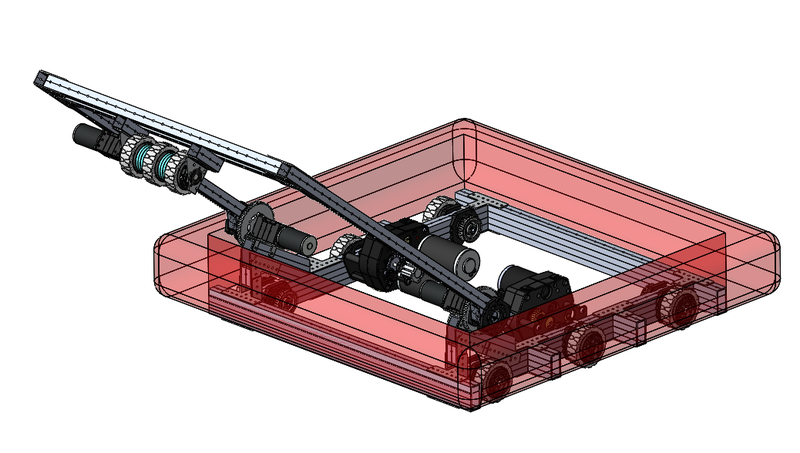 Using motors also allows us to be more flexible on where the intake arm can travel – if we haven’t completely figured out the final configuration, it makes it really easy to change around. Pneumatic systems would be more difficult to rearrange. We also, don’t want to add all the overhead of having pneumatics – extra tanks, manifolds, etc – we chose to keep it neat, tidy and light. Q: How did you decide on the roller speed? 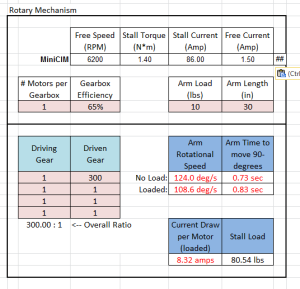 A rule of thumb that’s fairly popular in the FIRST community – however fast your drivetrain goes, have your intake rollers go a little bit faster than that – as fast as you can, actually, while still gripping the game object. One of the most important parts of the game is to capture the game object as quickly as possible. The faster you can do that, the quicker you can score – and the more matches you can win. 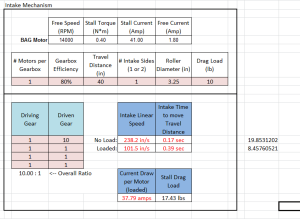 By setting the linear speed of the roller faster than the drivetrain, you can guarantee that as you drive up onto a ball and capture it, it won’t roll away from you. Once you touch the object, you own it. Q: What about this breakthrough you had with the VersaHubs? We got to a point with our initial design where we had packaging issues – Since we’re going over the bumper, the new 20” rule makes us work in a very small space. Our initial idea became really awkward and cumbersome. We weren’t sure we were going to be able to make what we had – an axle with a belt to a gearbox – work well, so we rethought the exercise. We moved the motor & its mount, and used something creatively – the VersaHubs – and we got a much better solution. We had a lot of time invested in the original intake, but this new one made a lot more sense. It’s going to be much faster once it’s built than the first idea we’d had. Q: How modular is this design? How will it fare in a competition environment? Part of the Build Blitz challenge is making something that will be competition worthy. For a team that’s actually competing, anything that goes outside the frame perimeter is going to get beaten up during matches – FIRST is a contact sport. The intake is one of the most important mechanisms for this game, and so it needs to be easily fixable & replaceable. If this intake gets damaged, we could swap out pieces or even the entire mechanism during competition. Even if this particular roller design doesn’t work out, we have contingency plans – sprocket and chain, belts, pneumatics – that we can work into design if we need to. For the case of an actual FIRST team, they could also swap out and adjust the entire mechanism with only a few fasteners between events if they needed to adjust their performance. This entry was posted in Build Blitz 2014, Team Copioli on January 5, 2014 by .